A few weeks ago, I was able to take the recently released Sony a6300 for a test drive, all thanks to my friends at Sony and Horn Photo. I shoot quite a lot with my Sony a6000, but this new iteration of the small wonder had a couple of very interesting features that I wanted to test out, namely 4K video and high frame rate video at 120 fps. This cool little camera also inherited a few nifty abilities from its bigger brothers such as Eye-AF, among other things. The camera is pretty much the same as the a6000 cosmetically except for a few minor additions (like the added switch knob on the AE-Lock button to give it an extra customizable button, and a speckled paint job), so it was easy to start using it along with my other cameras. In fact, I was able to take it to a couple of weddings with no hiccups. But for this first review, I wanted to try out the slow-motion feature using 120 frames per second. Along with the camera body, Glenn, the Sony rep that I know, was also kind enough to pair it with a highly-sought after lens — the Sony 85mm f/1.4 G-Master. I used this combination for the following video of a skateboarder in downtown Fresno. I wanted to get familiar with this combo, so I used it exclusively for this shoot (except for one shot with the Zeiss 12mm f/2.8 lens). I also used a Manfrotto monopod to keep my footage stabilized. The high frame rate performed beautifully. I was super happy with the quality of the video. Usually, you will lose some quality when you shoot at higher frame rates, but I didn’t notice a difference at all. In the past, I have borrowed or rented an RX10mkII to add slow-motion footage in my projects, but I dig this camera a lot more. It fits in quite nicely to the way I have my lineup already (which is two a7II bodies and two a6000 bodies). Plus, the integration of the high frame rates is way better than the RX10mkII. I did notice at the end of my shoot (I filmed for about 20 minutes) that the over-heating warning started blinking. Thankfully, I was finished filming. The afternoon I filmed this, the temperature in our city was around 110 degrees, so that might have affected my session somewhat. After testing out the camera, Sony also issued a firmware update to address the overheating issue. Unfortunately, I wasn’t able to test out the camera with the updated firmware, so I’m not sure if that has solved the issue. 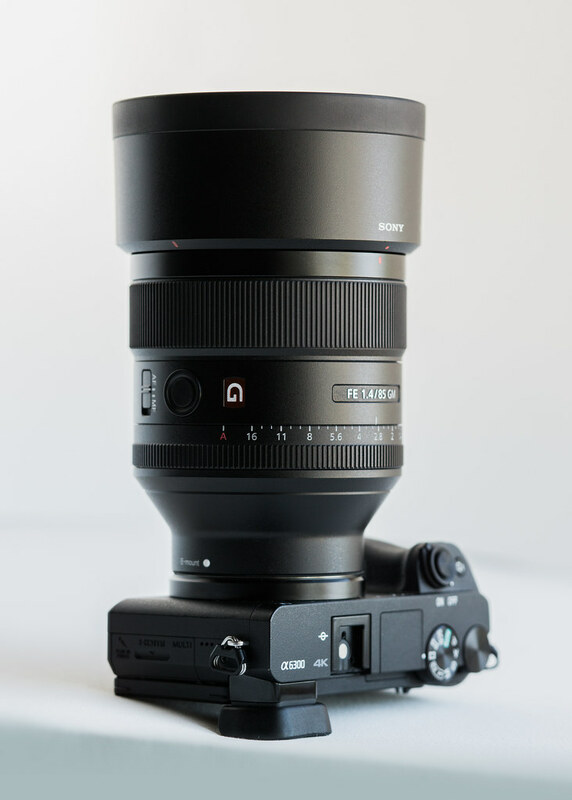 The Sony a63000 and 85mm f/1.4 G-Master lens combination. Now, to the 85mm G-Master. My general impression of the lens is this — it’s one of the nicest 85mm lens that I have ever used. I’m most familiar with the Canon EF 85mm f/1.2 (which I still own and use for video projects), and I would say it’s definitely in the same league, if not better. For video, I much prefer Sony’s G-Master lens, they did a really good job with how the focusing ring feels and acts while using it. It also has a switch to toggle between click and click-less aperture adjustment, which is nice for video. To me, it feels lighter and better balanced than the Canon 85mm. I also shot stills with it, but I will save my findings there for another article. One main thing to watch carefully when shooting video with the 85mm G-Master and a6300 is camera shake. I did notice this quite a lot when I was shooting handheld, so I made sure to use my monopod as much as possible. The shakiness gets smoothed out a little bit when you slow down the high frame rate footage, but my recommendation is to use a tripod or monopod, unless your lens has image stabilization. This made me miss the in-body stabilization that I’m used to with my a7II bodies. My takeaway is this — the a6300 is definitely worth the extra 400-plus-dollars compared to the a6000. The high frame rate feature alone is enough to justify this for me. When it comes time for me to upgrade my a6000 bodies (perhaps in a year or whenever they die on me), I will not be hesitating to upgrade them to the a6300. As far as the G-Master lens, I’d love to give it more coverage in a future article, just because there is more to be said, so I’ll let the video speak for itself for now. Check back soon when I post a few image samples and share my thoughts on the lens. Thanks for reading! I just wanted to say thanks again to Horn Photo for sponsoring this post and Glenn Weinfeld at Sony for letting me test out the Sony a6300 and the 85mm G-Master lens. Please support this website by purchasing items through the affiliate links in my articles. I only recommend photography gear that I use and love. If you are anywhere near Central California, I definitely recommend getting your gear at Horn Photo, they’re the best — and make sure to tell them your buddy, Mariano from Move to Mirrorless sent you 🙂 Thank you and happy shooting! Mirrorless photography is the next big thing, and it’s here! If you have any questions about switching to or starting with a mirrorless camera system, please feel free to ask by using the form below. I also reach out to my readers occasionally through a newsletter containing special content such as previews of new gear, videos, tutorials, and more. Use the same form to sign up and get advanced notice on all the exciting news. What camera do you currently use?